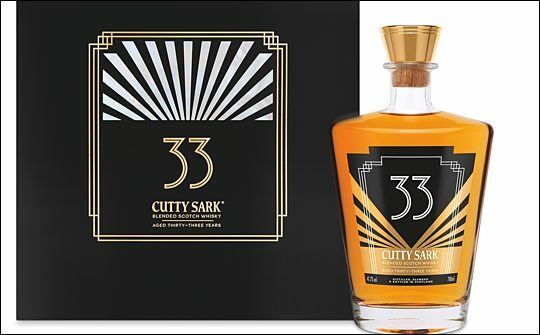 The latest expression of Cutty Sark blended Scotch whisky is the Cutty Sark 33 Year Old Art Deco, 41.7%abv. This limited edition of 3,456 bottles will be available from Edrington globally commencing this month at a RRP of £650. The bottling has been released to continue the exploration of the history, heritage and origin of Cutty Sark whisky, with a specific focus on the Art Deco period of the 1920s and early 1930s. Celebrating a time when Cutty Sark whisky found its way into America and flourished within the emerging cocktail culture. The bespoke bottle is decorated with sunburst and geometric designs in the style symbolic of the era. Presented in a piano black wooden box inlaid with mother of pearl, it also contains two decorated glasses and a 32-page book, which provides a brief insight into the Art Deco period.